During the last few years, thousands of people have had solar PV panels fitted to their roof to take advantage of the Feed In Tariff. Many people are entirely satisfied with their investment, the panels are working nicely and the payments keep coming in. However, what happens if you have had the panels fitted to your roof and now you find it is leaking? 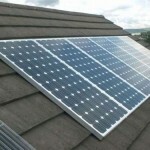 During the boom years of the feed-in tariff, hundreds of new solar companies fitting panels to thousands of houses. Now the boom has ended, many of these companies are no longer with us and therefore they are not their to fix any problems. Due to our experience and knowledge of roofing, RIS Roofing were contracted by many solar companies during the boom years to fit panels to roofs as the companies could be safe in the knowledge that the work was done right, first time. Our staff ensured that every panel was fitted properly through a roof, avoiding any issues of leaks or problems in the future. From our experience of roofing, and in particular the fitting of solar panels to roofs, we now offer a repair service to anybody who has badly fitted solar panels causing problems to their roof and home. Once the repairs to the roof have been carried out, our qualified staff will then replace the panels and re-wire them if necessary to ensure that your feed-in tariff payments are not affected.